This bell has: 14" bell and is 30" overall length, single tone in a semi-flat Red. 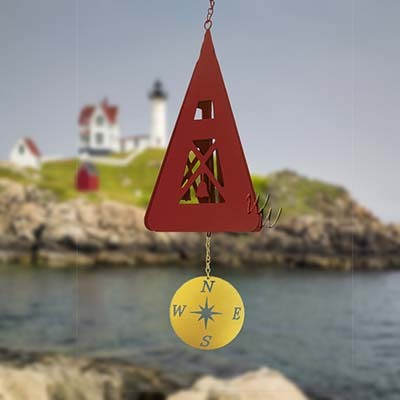 Our North Country bell features a Gold Compass windcatcher. Perfect for the Holidays, this bell captures the delight shared by all sailors on Maine's Penobscot Bay. Every North Country Wind Bell is shaped from a high grade steel known as Cor-Ten. This makes them ideal to hang outdoors year-round, and will not twist, tangle or break. As they weather, the steel turns a rich rust color. This natural oxidation doesn+t signal a deterioration of the bell, since Cor-Ten will never flake, peel or rust out. Instead, it tempers with age, creating clearer, more resonant tones. This patina both preserves and improves a bell+s tones over the years.